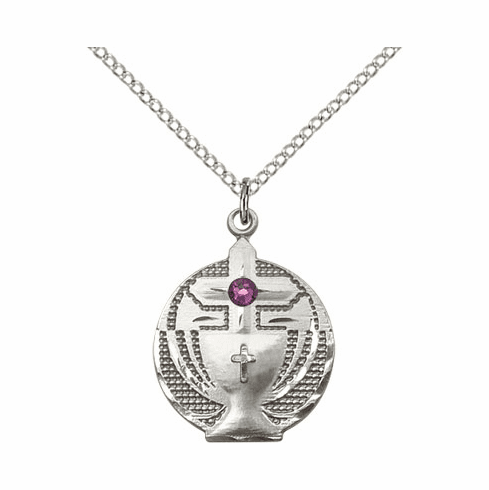 This beautiful sterling silver Christian 1st Holy Communion Chalice medal pendant features a 3mm Swarovski crystal birthday birthstone stone. The sterling silver pendant comes with an 18� lite curb chain and additional chains available. All religious pendants are made in the USA by Bliss Manufacturing and come in a deluxe gift box. Each Bliss medal carries a Lifetime Warranty from defects in material and workmanship. They are available in sterling silver, 14kt gold-filled, 14kt gold and 18kt gold. They make wonderful birthday, just because, First Communion gifts and much more.